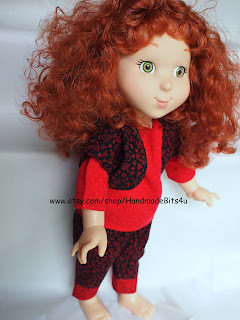 I've spent some more time in the sewing room working on clothes for American Girl and other 18" dolls. 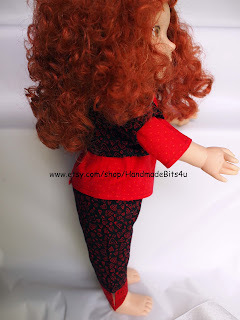 This time I worked on a 3 piece outfit in red and black. The top has sleeves, the pants are below the knees with cuffs, and the third piece is a short vest. The pants have an elasticized waist and the top has a velcro closing in the back so it can easily be put on and taken off. Next up is a blouse, skirt, and hat!